Phil Schiller took the stage today at Apple’s media event in San Jose to officially unveil the iPad mini, Apple's latest entry in the iPad line-up. As widely rumored, the iPad mini features the same 4:3 aspect ratio of the iPad with a smaller, 7.9" display carrying the same resolution of the original iPad and iPad 2 -- 1024x768. The smaller display has allowed Apple to cut down the overall size of the device, which also features a lighter form factor and thinner design, as well as narrower borders. The iPad mini is, from a design standpoint, reminiscent of the iPad 2 and third-generation iPad, with a flat aluminum back, albeit with more rounded edges. iPad mini is every inch an iPad. With its gorgeous 7.9-inch display, iPad mini features the same number of pixels as the original iPad and iPad 2, so you can run more than 275,000 apps designed specifically for iPad,” said Philip Schiller, Apple’s senior vice president of Worldwide Marketing. The iPad mini comes in two colors: white & silver and black & slate. 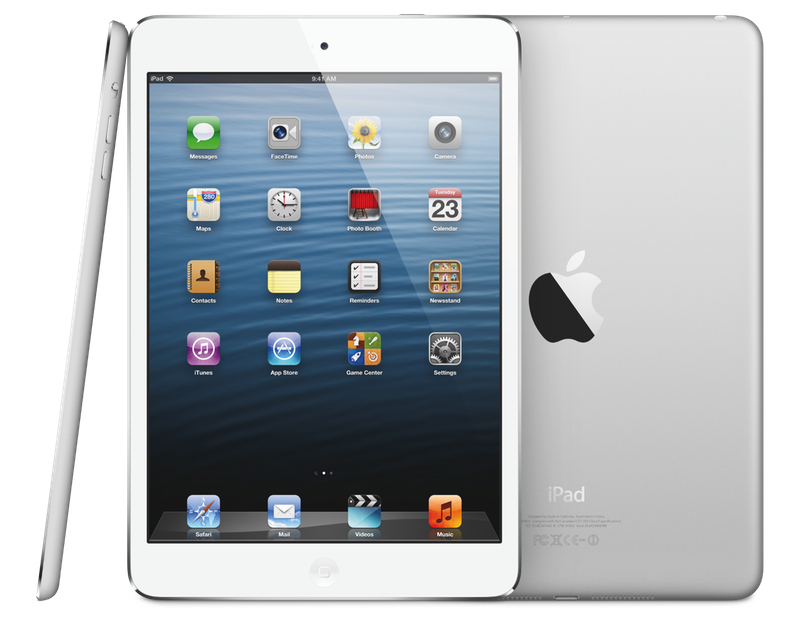 The biggest feature, however, is its design, which is only 7.2mm thin and 53% lighter than the third generation iPad. Schiller compared the thinness of the iPad mini to a pencil. 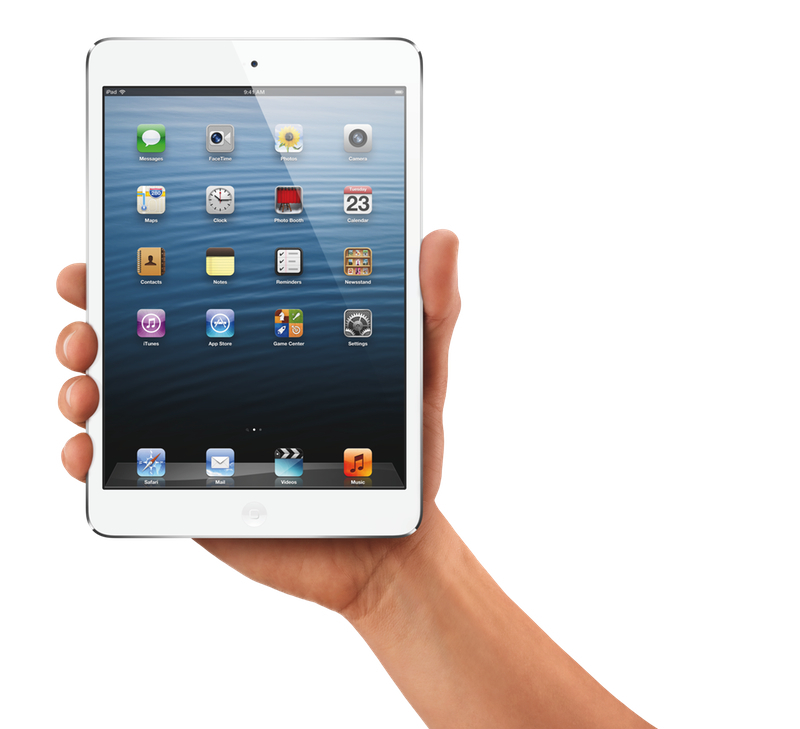 The iPad mini weighs 0.68lbs, making it as "light as a pad of paper". Because the iPad mini has the same resolution of older-gen iPads, developers won't need to update their apps to trigger a specific device (like they do with the iPhone 5), and every app that works with the iPad and iPad 2 will be compatible out of the box with the iPad mini, no changes needed. This gives the iPad mini access to over 250,000 apps available exclusively for the iPad on the App Store. The iPad mini doesn't have a "Retina display", which is still exclusive to the third-generation iPad announced in March, and the fourth generation iPad announced today. In a demo on stage, Schiller compared the wide range of software available for the iPad to that of competing tablets -- namely, Google's Nexus 7 Android tablet -- noting how the iPad mini, even with a smaller display, gets all the full-size apps specifically built for the platform, and not "stretched" versions of phone applications. The 7.9-inch Multi-Touch display delivers the same iPad experience users have come to expect, in a design that has 35 percent more screen real estate than 7-inch tablets and up to an astonishing 67 percent more usable viewing area when browsing the web. The iPad Mini comes with iOS 6, and, obviously, the new Lightning dock connector introduced in September. During the demo on stage, Schiller focused on compatibility with existing native and third-party apps, rather than announcing new apps or iOS features. Apps demoed on stage included Vimeo, Mail, Yelp, and Safari. According to Apple, they engineered the iPad mini to "condense" all the features of the 9.7" iPad into a smaller unibody construction, rather than having to exclude features customers were used to. 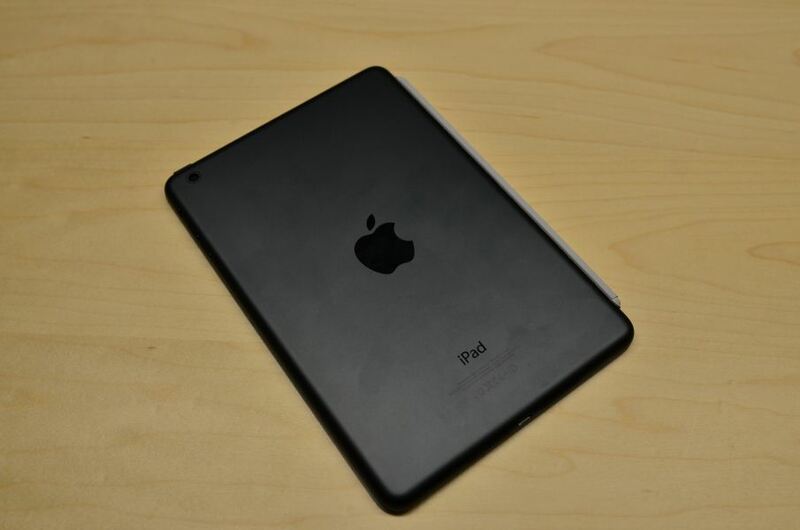 It is a new, smaller device, with the same features, and roughly the same hardware of the iPad 2. But iPad mini isn’t just a scaled-down iPad. We designed it to be a concentration, rather than a reduction, of the original. A refined unibody consolidates more parts into one. A single-cell battery — the thinnest ever made by Apple — takes up less space, but lasts just as long. The iSight camera is smaller, yet still takes 5-megapixel photos and shoots full 1080p HD video. And while the display is slimmer and lighter, it’s also incredibly vibrant. In fact, the iPad mini packs the same dual-core A5 processor seen in the iPad 2 last year. Driving a 1024x768 display, the A5 ensures fast performance and the same 10 hours of battery life. iPad mini comes with two camera: a 5 MP iSight rear camera, and a FaceTime HD front-facing one; the rear camera can shoot 1080p video and, obviously, take still pictures. The iSight camera includes video image stabilization and both cameras feature backside illumination. iPad mini starts at $329 for the base 16 GB WiFi model. Different price ranges are available for higher-capacity WiFi and WiFi + Cellular models. 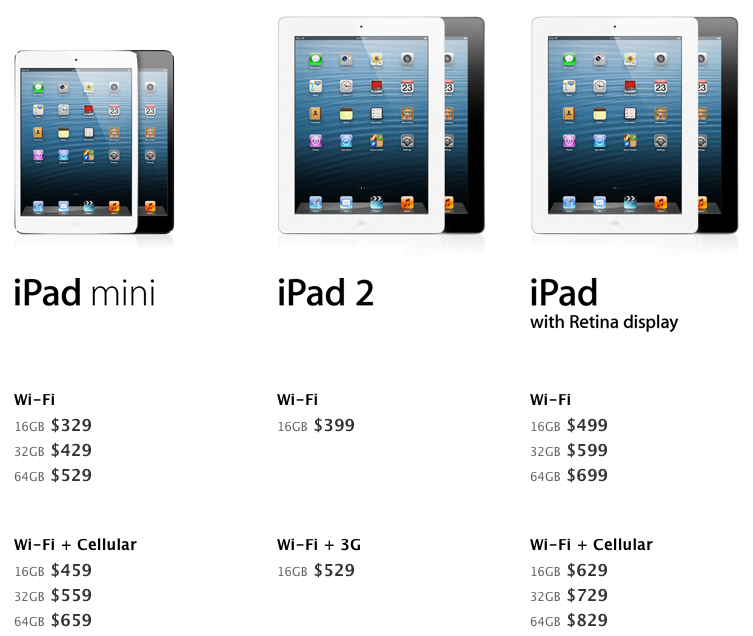 Here's Apple's updated iPad line-up from a price standpoint. The WiFi+ Cellular model will begin shipping "a couple of weeks" after the iPad mini WiFi. 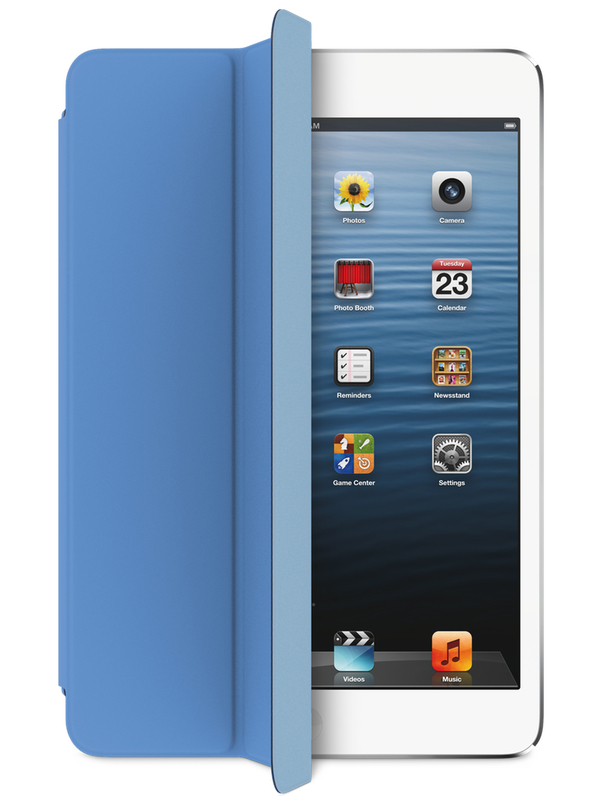 With the iPad mini, Apple is releasing a brand new Smart Cover as well. Redesigned for the smaller device, it integrates the magnetic hinge directly in the colored part of the accessory. iPad mini uses a nano-SIM. The 4th generation iPad uses a micro-SIM. According to Apple, iOS is capable, on the iPad mini, of recognizing whether your thumb is resting on the narrower border, or tapping on the interface. Rethinking the screen meant we also had to rethink the software behind it. iPad mini intelligently recognizes whether your thumb is simply resting on the display or whether you’re intentionally interacting with it. It’s the kind of detail you’ll notice — by not noticing it. As noted by setteBIT, LTE isn't mentioned in the iPad mini tech specs on the Italian website. TIM, one of Italy's major carriers, recently announced they'll be rolling out "iPhone-ready" LTE in November. MacRumors' Arnold Kim notes how DigiTimes "predicted" an iPad 3 in March and iPad 4 in October back in January. 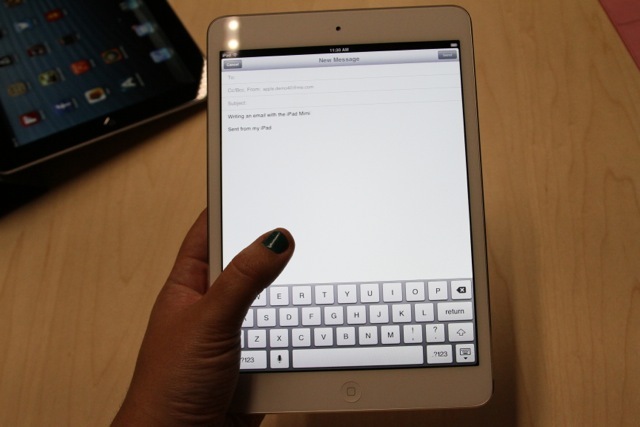 The first "hands-on with the iPad mini" articles are rolling in. 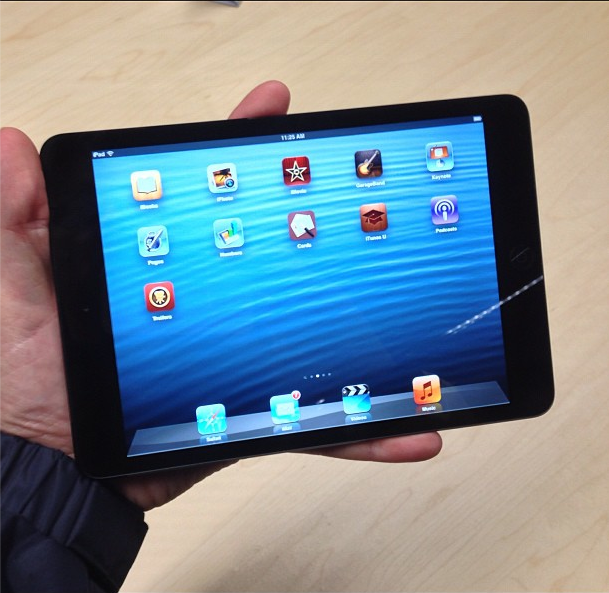 The Loop's Jim Dalrymple notes how "the iPad mini can easily be held with one hand for reading". The Mac Observer's Dave Hamilton says the device, despite lacking a so-called Retina display, still presents "crisp and sharp text"; the sentiment is echoed by The Verge's Joshua Topolsky, who notes "text on the iPad mini "looks incredibly sharp". The Verge has also uploaded a first hands-on video on YouTube. AnandTech has posted a photo of the WiFi + Cellular iPad mini, showing the usual "black stripe" along the top of the device for the RF module. They note that "there's a pretty noticeable difference between the A5 in the iPad mini and the A6X in the 4th gen iPad as you'd expect". They've also uploaded two videos -- one is embedded below, but make sure to visit AnandTech for both. Last, according to Slashgear, you can grip the iPad mini "comfortably in one hand, fingers wrapping around the edges just as we’ve praised". Update 5 PM ET: A nice photo by Dave Hamilton, showing the iPad mini can be held with one hand. 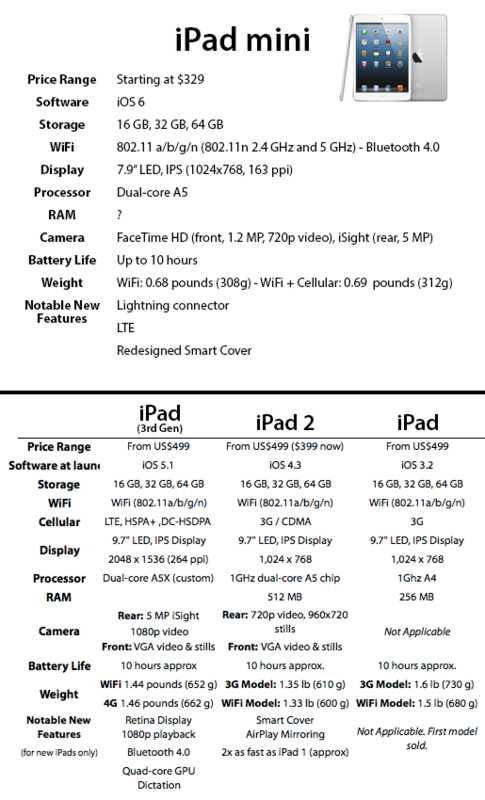 As an iPad 3 owner, I put together a comparison chart for the iPad/iPad 2/iPad 3 versus the new iPad mini. In her hands-on with the iPad mini, Ars Technica's Jacqui Cheng writes that she finds "barely doable, but still possible" to hold an iPad mini with one hand. She also notes the iPad mini felt "cheaper" than an iPad 3 due to its thickness and slightly different back. Make sure to check out her first impressions here, as they offer a very unique perspective. And here's more video material from YouTube as more people upload their first hands-on videos. As with every keynote, we conclude our overviews with a Storify bundle collecting the best tweets we've saved throughout the day. Here's a list of useful links to know more about the new iPad mini. For more coverage, check out our October 23 news hub and follow @macstoriesnet on Twitter.